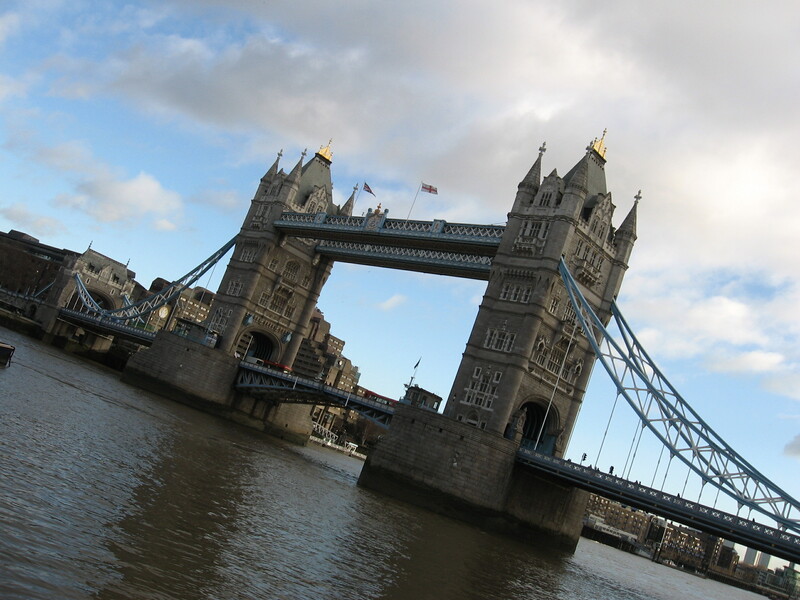 A view askew of Tower Bridge, from the southbank. Photo by the author. It wasn’t until about a month after my mini-break weekend in Dublin, once my sister had flown in from Los Angeles to ride the rails all over Britain with me (we were on our winter holidays away from school), that I finally saw London. I’ve been an Anglophile for as long as I can remember. As such, I have always found the movies to be the perfect instrument to satisfy my intense interest in all things British. There are simply too many films set in London to name, but suffice it to say that before arriving in town (after a three-hour-long train ride from Newcastle in the Northeast), I had seen the city of my dreams represented in such classics as Alfie (Lewis Gilbert, 1966) and A Clockwork Orange (Stanley Kubrick, 1971), through to more contemporary fare, like Wonderland (Michael Winterbottom, 1999) and About a Boy (Chris & Paul Weitz, 2002). But none of these films captures the London that I experienced around Christmas in 2006. Instead, we searched for the blue door of Hugh Grant’s travel book shop in the eponymous neighborhood of Notting Hill (Roger Michell, 1999), knowing full well the owners had repainted it to prevent passersby from peeking in. We strolled along the titular street of Brick Lane (Sarah Gavron, 2007) and wound up in a McDonald’s rather than a curry palace. We shopped for souvenirs from the open-air market stalls in Camden, which are on display in Mike Leigh’s comedy-drama Happy-Go-Lucky (2008), but the stench of pot and incense drew us away. Opting for the bus only once and using the tube to get everywhere, we did an awful lot of walking around London during our week or so in the city. And on December 25, when all of London—especially these public transportation networks—shut down, we were unable to leave our hostel to perform our yearly ritual: Chinese food and a movie. You’ve seen this one before: the view from the Tate Modern across the Millennium Bridge. Image courtesy of http://www.wikipedia.org. My sister and I explicitly chose not to do “touristy” things. (Don’t ask why, we were stupid and cheap and wanted to avoid crowds as much as possible.) We didn’t tour the Tower of London or see Big Ben up-close. We double-backed on hitching a ride aboard the London Eye (that’s really something I regret). No Westminster Abbey, Leicester Square, or Houses of Parliament for us, I’m afraid. We mainly kept to museums, like the British Museum and National Gallery—yes, both of which entice visitors with offers of free admission. The Tate Modern was on the top of our must-see list, and from there we strolled across the Thames on the not-so-new Millennium Bridge, toward St. Paul’s Cathedral. 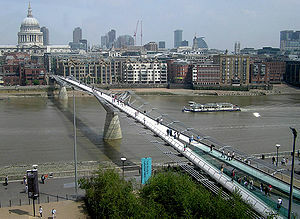 This part of London—Southwark, it’s called—is frequently represented in film: everything from Bridget Jones’s Diary (Sharon Maguire, 2001) to Salmon Fishing in the Yemen (Lasse Hallström, 2011) features its protagonist on this at one time eye-catching bridge, either making a resolution or having an existential epiphany. Well, nothing as lofty as that happened while I was on it. Not too far from the Tate, on the south bank, is the reconstruction of William Shakespeare’s Globe Theatre, and even farther down, just east of Tower Bridge is the Design Museum, whose exhibitions focus on 20th and 21st century design across various industries. I remember never having heard of it before my sister suggested we go there, and it turned out to be one of the highlights of our trip. I can’t remember exactly what we saw, but after days of walking around London and feeling as if we weren’t “seeing” anything, I felt warm and fuzzy, a real sense of accomplishment. Stupidly, I thought we’d visited a place so far off the beaten path that it wasn’t on most international tourists’ radar. After all, it’s not as busy as the Victoria & Albert Museum. 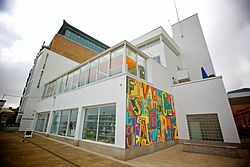 The Design Museum in 2010. Image courtesy of http://www.wikipedia.org. I’ll never forget our approach to the Design Museum, trekking through a disorienting labyrinth of buildings that all looked the same and climbing a tiny incline right at the end, stepping lightly on the cobblestone street the whole time so as to avoid twisting our ankles. Aside from the Design Museum, which at the time was painted a bright white (I’d be willing to bet that it still is), all of the other buildings at Butler’s Wharf are brick warehouses with arched doorways and, according to Wikipedia, were once considered derelict. Gradually, over the past thirty years or so, the late 19th century shipping district has been home to luxury flats and a happening restaurants and arts corner. (Bridget Jones and her lascivious boss Daniel Cleaver dine here.) I should mention that we could hear the lapping of the river even if we couldn’t see it while walking along Shad Thames, the area’s main street. Almost one and a half years later, I saw Run Fatboy Run (David Schwimmer, 2007) in the theater with my dad, and early on in the film I recognized one of its shooting locations straightaway: the Butler’s Wharf/Shad Thames warehouse district. “Pathetic excuse for a man” Dennis (the always charming Simon Pegg, who rewrote the script) has his ex-fiancee and mother of his child pick he and the boy up from the police station (he got caught buying scalped theater tickets), and she brings her new handsome, super-successful American boyfriend along with her. After putting Libby (Thandie Newton) and Jake (Matthew Fenton) in a cab, Dennis and his rival Whit (Hank Azaria) walk along Lafone Street, making awkward conversation and being generally passive-aggressive toward one another. Besides Bridget Jones’s Diary, I had never seen this part of London on-screen before (I didn’t even know what it was when I first saw that rom-com), and since “discovering” it on my way to the exemplary Design Museum, it has always felt like “my London.” Thus, despite being set in North London (but mainly shot in the East, according to The Worldwide Guide to Movie Locations), Run Fatboy Run memorably takes place in parts of the city that I most identify with. 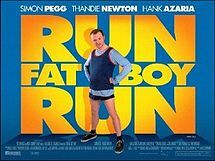 As you may already know, Run Fatboy Run revolves around Dennis as he trains for the Nike River Run, a fictional stand-in for the London Marathon. He aims to prove to everyone—including Libby, Whit, Jake, his friend and coach (Dylan Moran), and the landlord to whom he owes a lot of back rent—but especially himself that he can commit to finishing something, after having ditched a pregnant Libby at the altar years ago (he has always loved her, though). Of course, there are many obstacles to achieving this goal; the greatest is having to hobble the long distance on a severely sprained ankle. It takes him all day and all night. Notably, the marathon route commences near the financial district in the City of London where Whit works, the Gherkin a stone’s throw away (that, we saw up-close), and finishes just outside St. Paul’s Cathedral. To get there—you guessed it—Dennis must cross the Millennium Bridge from the south side, his entourage of fans and a sports reporter cheering him on as they follow close behind. His journey reminds me of my own. Now, I cannot claim to have completed a marathon as Dennis has done in fourteen hours, but because my sister and I spent a long and tiring but wonderful day in Southwark walking from landmark to landmark, I can claim to have conquered them in my own way as a tourist. After all, the views were free. Tomorrow: another entry of Movie Travel Diary. But while we’re waiting, tell me about your movie-related experiences in London. Which film(s) best encapsulates the London you know from your own travels? I dig the whole “avoid other tourists” approach! Getting a little off the beaten path makes for more interesting experiences.